The Darcy Unit and The Garden Unit await those of you looking for a retreat in the heart of our village. The Jefferson Inn has two attractive, efficiency units available for the business traveler, guests preferring additional privacy or for those traveling with young children or a pet. Walk up the garden pathway to your own porch and enter directly into your unit. 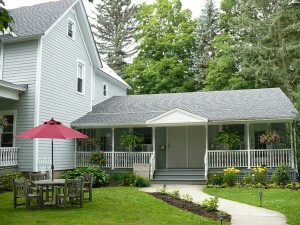 Each suite is decorated in a country cottage décor. These luxury suites have a queen size bed and a loveseat that can be opened into a single bed. 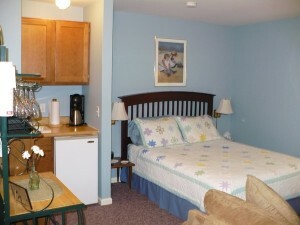 Each unit also has a TV/DVD and gas fireplace. The efficiency suites have a mini kitchen for guests to make breakfast or snacks during their stay. The kitchen includes a refrigerator, microwave, toaster, coffee maker, hot water kettle, dishes, glasses and flatware. Breakfast is not included. The Jefferson Inn provides complimentary coffee and tea. Each luxury suite has a private bath, cozy bathrobes, hairdryers, alarm clock/radios, sound machine, window air conditioner, separate heat controls, outgoing telephones, free wireless Internet and access to the outdoor hot tub. All the essentials for your comfort are available in your rooms, including extra pillows, blankets and towels. These cozy, compact units allow for a relaxing, quiet home away from home right in the heart of Ellicottville, N.Y. Relax on your private porch and watch the town go by or curl up with a book in front of your fireplace. The Darcy and Garden Suites are decorated in a soothing blue with a country cottage feel and a view of the Enchanted Moutains region of Western New York.